Charlie Chaplin’s “Smile” was never supposed to end up on the latest album by Portugal’s musical grande dame. Mariza, a fado powerhouse, and Brazilian pianist Ivan Lins were just clowning around, having some fun with the sweet song that’s been covered by everybody from Barbra Streisand and Diana Ross to Judy Garland and even Michael Jackson. That is, until they realized producer Javier Limón had been secretly recording them. When she looked up and saw tears in his eyes, she wondered what she had done. “I thought we broke something, I thought we did something wrong!” she exclaims. 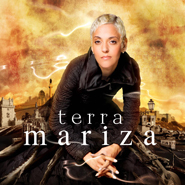 Sung with the kind of beautiful melancholy that only a fadista can bring, it instead ends up as a bonus track on the North American release of Terra, a musical proclamation that Mariza has come into her own. Mariza calls “Smile” a gift, a “present for the kindness people have given to me through all this time, trying to understand me. It’s my way of saying ‘Thank you’.” And audiences have certainly enjoyed watching her transform. If her debut album Fado em Mim was an effort to establish her knowledge of the fado tradition, having grown up in her father’s fado house in Lisbon, her second release Fado Curvo allowed her to put her own stamp on the tradition while demonstrating that there are more ways than one to move artistically from point A to point B. Her next release, Transparente, a more intimate, classically-inspired take on fado, expressed Mariza as a more experienced and sophisticated artist. Since then Mariza has continued to wow audiences with her powerful talent as a live performer, recording the album Concerto Em Lisboa to a hometown audience of several thousand right next to that most visual icon of fado — the sea. She has also traveled the world, selling out concert halls, from Carnegie Hall and Disney Concert Hall to London’s Royal Albert Hall and the Sydney Opera House, and winning awards, including a BBC World Music Award and 2008 Latin Grammy nomination. Now a mature performer, Mariza’s Terra showcases the new voice of Portugal, a voice comfortable enough with Portuguese music to have some fun with it. On the one hand, Terra is firmly planted in tradition; tracks like “Já Me Deixou” and “Rosa Branca” rejuvenate well-worn, beloved songs of the past, and “Recurso” demonstrates her lifelong commitment to fado, having discovered this hand-written, never-published poem by David Mourão-Ferreira in a fado museum. Collaboration with other musicians yielded musical fruits on the tracks of Terra as well. “Fronteira,” a lively song discussing the real and imagined borders between Portugal and Spain, features a folkloric Portuguese rhythm from the north that is made to sound gently Cuban through the playing of Chucho Valdes, the Cuban pianist and bandleader more known for his jazz stylings, and with a battery of Portuguese percussion played by Spanish master El Piraña. “Alma de Vento” was created in the highly unconventional manner of having a guitar line first sent to her by Dominic Miller, an Argentinian-born, London-raised musician who now plays with Sting, around which she had to find the right lyrics. Perhaps the most memorable musical melding on the album happens in the morna “Beijo de Saudade.” The poem was written in misery in 1958 by one of the greatest Cape Verdean poets, B.leza, who had married a fado star, moved to Portugal, and found himself dying in a hospital bed where he saw the sea — and his tiny, faraway home island — through the window. Joining her on the track is Tito Paris, a Cape Verdean icon, living in Lisbon who has worked before with Mariza and Cesaria Evora, among others, and who blends African influences into the Portuguese musical landscape. Half Mozambican herself, Mariza finds the collaboration on Terra deeply personal as well, saying that “Tito is putting the African part that is missing in me, and I’m putting the Portuguese part that is missing in him.” Along with an elegant muted trumpet, the track is loaded with enough fado-worthy longing to create a timeless masterpiece. Iberian splendor is captured in the track “Pequenas Verdades,” a sweet tune written for Mariza by Limón himself. Wanting to retain the original Spanish flavor, they brought in Concha Buika — known simply as Buika — a meteorically rising Afro-Spanish flamenco singer. It’s easy to put a star like Mariza into a musical box. Fado, the beguiling music that helped catapult her onto the global soundscape, also taunts her like a jealous lover never wanting to be neglected for too long, a curious and passionate relationship she recounts on the track “Mihn’Alma.” Yet the transformed Mariza firmly stands her ground. With a new musical family surrounding her and the voice of experience and tradition behind her, she reaches out to give Portugal a new sound.